While most of drivers started on worn tyres, to check the grip of the track, Soheil Ayari (Oreca Saleen) sat waiting at the end of the pitlane…. 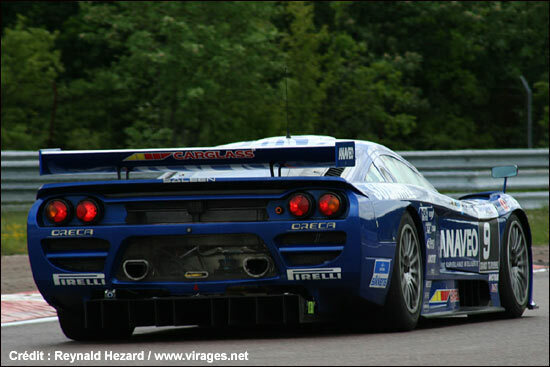 Eric Cayrolle (SRT Corvette C5-R) was quickest initially, ahead of Palttala (PSI C6R), Besson (First Racing Viper) and Policand (Larbre Ferrari Maranello). However, with the track drying, all drivers pitted for new tyres. Ayari then ventured out, and was straight away second quickest. Positions were changing though. Alliot was first man under 1'15''., but Ayari improved and set the pole, ahead of Alliot, Palttala, Beltoise (Mirabeau Viper), Thévenin (VBM Viper) and Policand. In the GT2 Trophy, the fight was between Narac (IMSA Porsche 996 RSR), Michel Monteiro (Estoril Porsche 996 RSR) and Prunet ( Protek Porsche 911 GT3 RS). Narac set the pole, ahead of Prunet who improved on Monteiro's laptime in the late session. 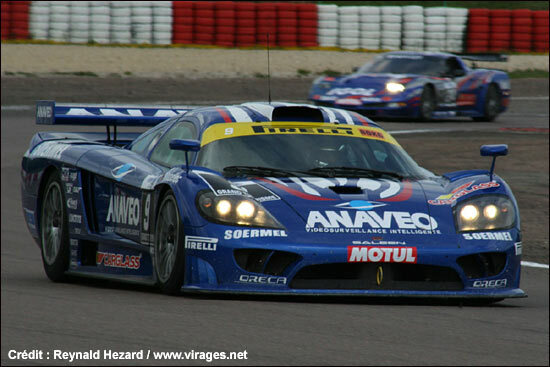 In the French Cup, Rousseau (Pouchelon Racing Dodge Viper GT3) was quickest, close to the GT2 lap times. Colas, Gimond and Rodrigues came behind, all with Porsche 996s. From the second row, Paltala surprised everyone and took the lead, ahead of Ayari's Saleen. Then came Alliot, Beltoise, Policand, Dumez ( #11 Euroflash Autovitesse Viper) and Thévenin. Palttala set a strong pace, followed closely by Ayari. Alliot was third while three drivers were fighting hard behind him: Beltoise, Policand and Dumez. Policand tried to pass Beltoise but couldn't succeeed, the three cars running neck and neck. Thanks to some daring moves among the backmarkers, Palttala increased his lead. 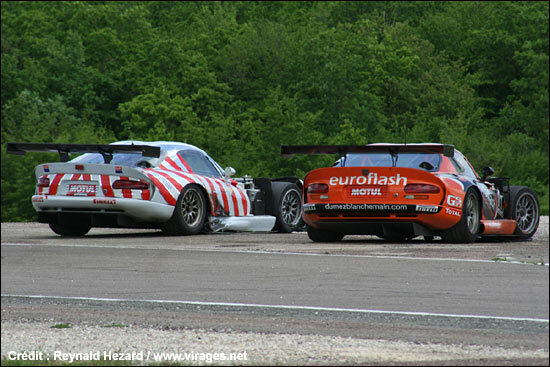 Just before the pits opened, Dumez made contact with the Red Racing Viper. The safety car appeared, to allow the marshals to clear the damaged cars off the track. In the pits, many teams were wondering whether they should call in their car or not, for the compulsory driver change. 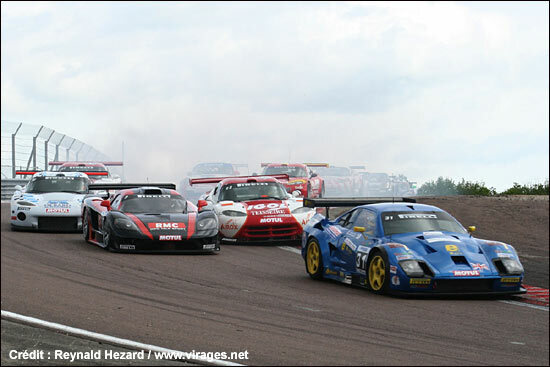 Oreca was first to call Ayari in, then First Racing called in Bruno Besson (First Racing Viper), who was in ninth place. All the drivers pitted one lap later but Hernandez ( #9 Oreca Saleen) and Peyroles (#5 First Racing Viper) were now just behind the safety car – enjoying the advantage of having pitted before the rest. When the race went green again, Peyroles passed Hernandez and took the lead. Hernandez was ahead of Debard (#14 Tarrès Team Viper), Dubreuil ( #23 CD Sport Viper), Brandela ( #31 Creation Autosportif Lister Storm), Kuismanen (#25 PSI C6.R) and Hallyday (#24 PSI C5-R) who set some quick lap times and moved up to third position. Hernandez reacted to Hallyday's threat and overtook Peyroles for the lead. Hallyday also passed Peyroles and was five seconds behind Hernandez - but made a mistake when lapping a Ferrari. He dropped down to third place, just ahead of his teammate Kuismanen. Hernandez was now a secure leader and claimed the fourth win in the season for the Oreca Saleen, but only by three seconds, while Hallyday passed Peyroles for second place. Kuismanen passed Peyrroles too, but on the last lap he made a mistake, made contact with Peyroles - who resumed racing and claimed the first podium for First Racing. In the GT2 Trophy, Narac/Lecourt (IMSA Porsche 996 RSR) were easy winners, even though they had a stop and go, ahead of the Monteiro brothers (Estoril Porsche 996 RSR) and Prunet/Mouez (Protek Porsche 911 GT3 RS). In the FFSA GT French Cup, Vincent Rousseau (Pouchelon Racing Dodge Viper GT3) was the best starter and could keep the lead, though his partner Vannelet had a stop and go penalty. The Rodrigues brothers (Porsche 996 Cup) were second and Jérôme Laurin/Guy Clairay (GCR Dodge Viper GT3) third. 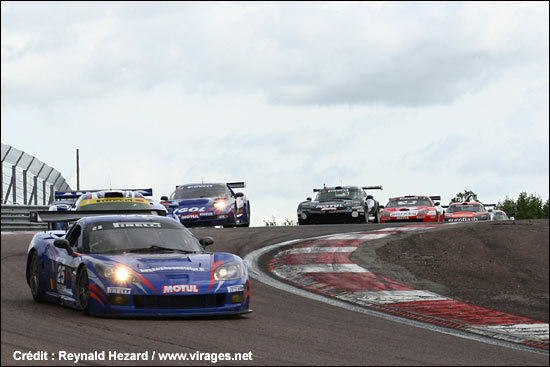 Bruno Hernandez (Saleen S7-R, Team Oreca): "This win belongs to Team Oreca. The strategy was perfect, we must pay a tribute to Pierre Dieudonné and to our Engineer Jean-Philippe Pelaprat. All through the weekend we haven't made any mistakes, we were not quickest on the track, but we were the most reliable and the most consistent." Suddenly, with the rules changes, the FFSA GT series has really come alive.